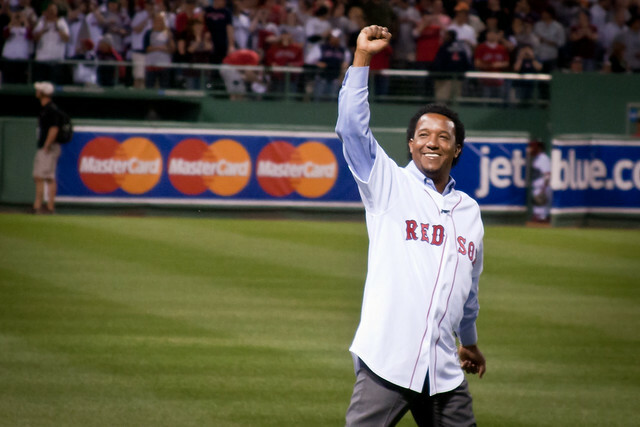 Without a doubt, Pedro Martinez is one of the best pitchers of the late 90's and early 2000's. Is he one of the best pitchers of all time? That's certainly up for debate. But for those that watched him pitch in his prime, there was no one more dominant than Pedro was. Yet, since his career ended in 2009 for the Phillies, Pedro Martinez cards, besides a few of his rarer autograph and memorabilia cards are fairly inexpensive when compared to the cards of other greats. This is despite the fact that he is today enshrined in the Baseball Hall of Fame. This article is both a tribute to a great pitcher and as a guide to Pedro's more valuable cardboard treasures. While most Pedro Martinez card collectors are interested mostly in his rookie cards and Red Sox-era cards, this is certainly one card that should be a part of any Pedro Martinez baseball card collection. I do not personally have one yet, but this is certainly on my wish list! This card is numbered to 900, so it's fairly rare. It usually sells between $45-60 USD on popular auction sites like EBay. There is another card that is nearly identical to the previous card, except that it is part of a subset called Millennium Marks. It's numbered to 1000, and is a bit less expensive that its slightly more rare counterpart, about $40 USD. In my opinion, it's actually a nicer looking card. Many of the Pedro Martinez rookie cards on the market today are fairly inexpensive and can be had for about $3 USD, or even as little as $1 USD not including shipping charges. There is just such a large quantity of most of them today, that on sites like EBay, you can pick up lots of 20 or even 40 or 50 because they were collected so heavily back at his peak. True, they're not worthless, but hardly the investments that many envisioned. The 1991 Classic Best Pedro Martinez #355 rookie card featuring the future superstar and Hall of Famer in a San Antonio Missions uniform is one of the few that's worth about $5-6 USD. Basically, any of the minor league cards, what many card collectors refer to as "pre-rookies" are the ones you should seek out, since the majority of his rookie cards can be purchased as part of assorted lots that you can purchase on Ebay for less than $5. I myself picked up 3 of his rookie cards in one such lot. This Classic Best card is one I'm still looking to add to my collection. Rarest Pedro Martinez Rookie Card Ever? The rarest Pedro Martinez rookie card is perhaps the Pedro Martinez card from 1990 Sport-Pro Great Falls Dodgers team set﻿﻿. It's his first ever card printed, and many copies on the open market today are PSA-graded. So, it's moderately rare, and many copies, especially graded ones, can fetch as much as $50-60 USD. If you're able to secure a copy relatively inexpensively (the best way is to find a set of Great Falls Dodgers cards that includes the Pedro card) then you should definitely pick it up. If you're a Dodgers card collector, the set also has the first rookie card of Raul Mondesi, certainly not as valuable today as it once was, but still a rookie card of a minor star. Otherwise, Pedro is the only other star-caliber future Major Leaguer in the set.